Pictured are Mrs. Heather Hundt, director of Bands at Rolland-Warner Middle School, Ms. Stephanie Wilcox (clarinet), Mr. Scott Boerma, Director of Bands at Western Michigan University, Mr. Timothy Waelde (trumpet) and Mr. Daniel Hundt, director of Bands at Lapeer West. Stephanie Wilcox and Tim Waelde, two recent Lapeer West graduates, are currently pursuing teaching degrees in music education at Western Michigan University in Kalamazoo. They perform with the Symphonic Band under the direction of Mr. Scott Boerma. 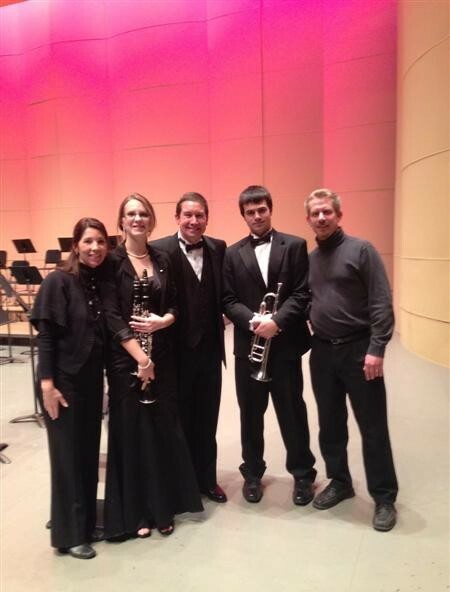 This photo was taken at Miller Auditorium at WMU following their most recent concert on Sunday. It’s great to see our former music students and graduates from Lapeer being successful and doing great things at the university level. Way to go!